The perfect blend of sweet and savory, this refreshing summer salad packs the most flavor when made with farm-fresh ingredients. Find more Farmers' Market inspired recipes in our Farmers' Market Cookbook! 1. Peel and chop 1 peach. Cut remaining 4 peaches into ¼ inch rounds, cutting through stem and bottom ends. Discard pit. 2. In a food processor, blend the chopped peach, green onions, chopped cilantro, honey, spices, salt, lime zest, and lime juice until smooth (about 10-15 seconds). Add olive oil and pulse 3-4 times until thoroughly combined. 3. Spray grill with cooking spray and preheat to 350-400 degrees F. Brush both sides of peach rounds with peach dressing and place on grill. Cover and heat for 3 to 5 minutes on each side (grill marks should appear). 4. Arrange arugula evenly on 4 plates. 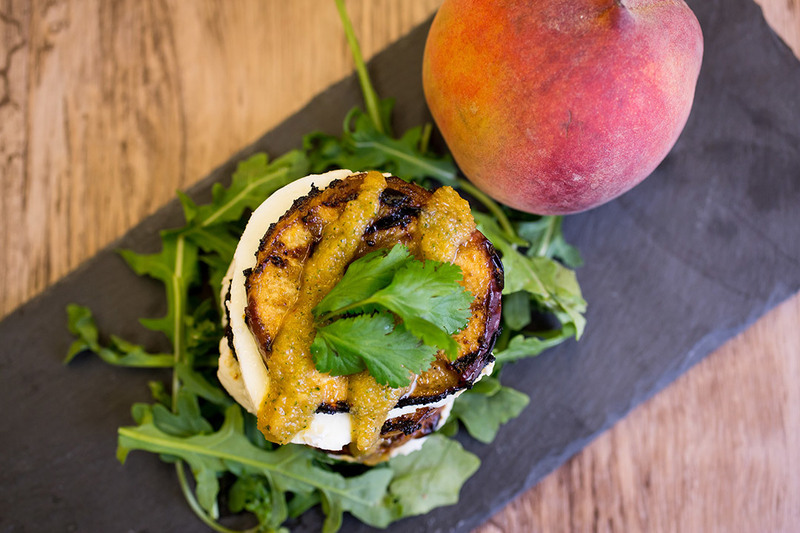 Alternately layer 4 grilled peach rounds and 3 cheese slices over the arugula on each plate. Top each with 3 more peach rounds. Drizzle with remaining peach dressing and garnish with cilantro. Serve immediately.